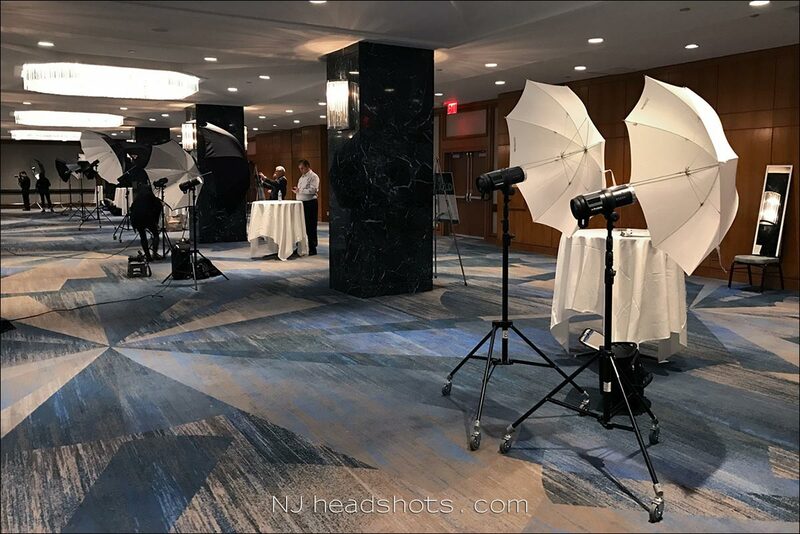 The headshots photo session out at your location requires flexibility in terms of the logistics and the flow of the photo session. It is all quite adaptable around your needs. 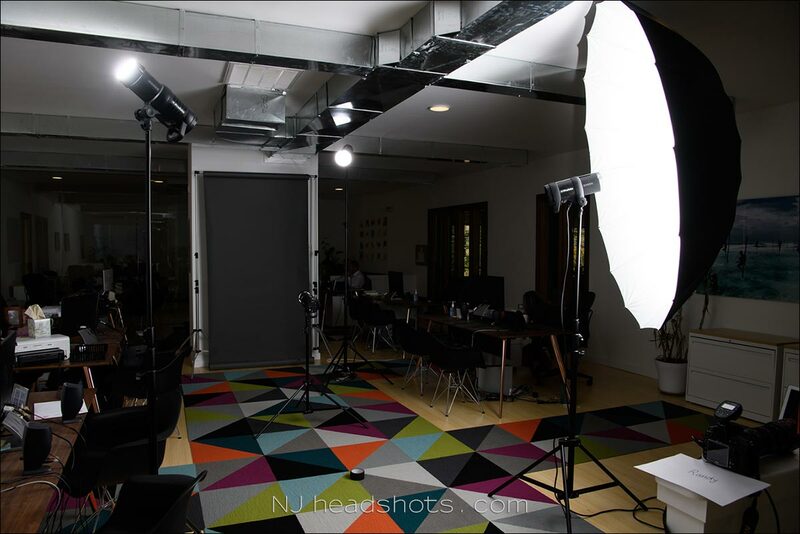 With this, I want to show some of the various setups I have worked with when doing group headshots sessions for a company. This could be at the company’s offices or at a hotel or other venue. Wherever it is, we can make it work. As the photo above shows, where it is feasible the photographs are taken tethered to a laptop so that everyone can see what the images look like. I want your colleagues and employees to be able to select a favorite image on the spot. We could always do the image selection later on via an on-line gallery, and that is also a good option when there is a time crunch. 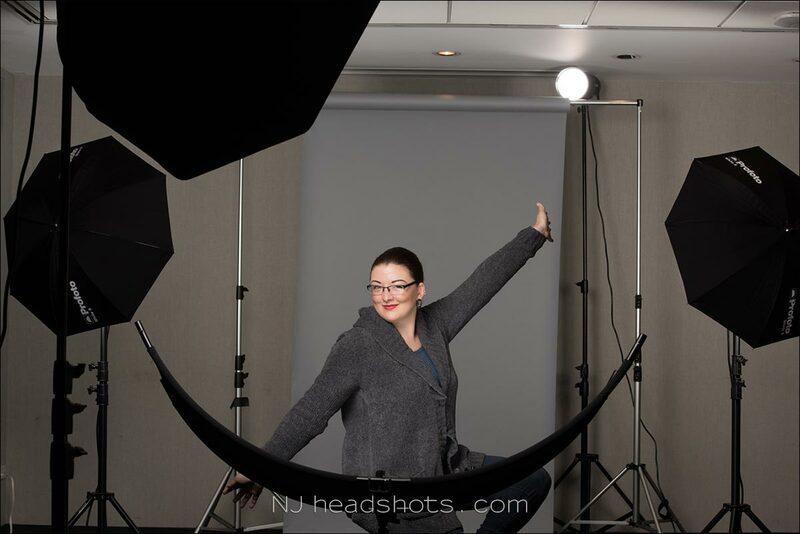 But I find that there is more energy and involvement when people can see their headshots as we take them. This allows us to do some adjustments to clothing and perhaps even hair. We can finesse the pose and positioning. Right then and there. With these kind of headshots for a group, we work out a time-table with you to stagger the timing of the session so that people come in one-by-one without a bottleneck to the flow of the photo session. 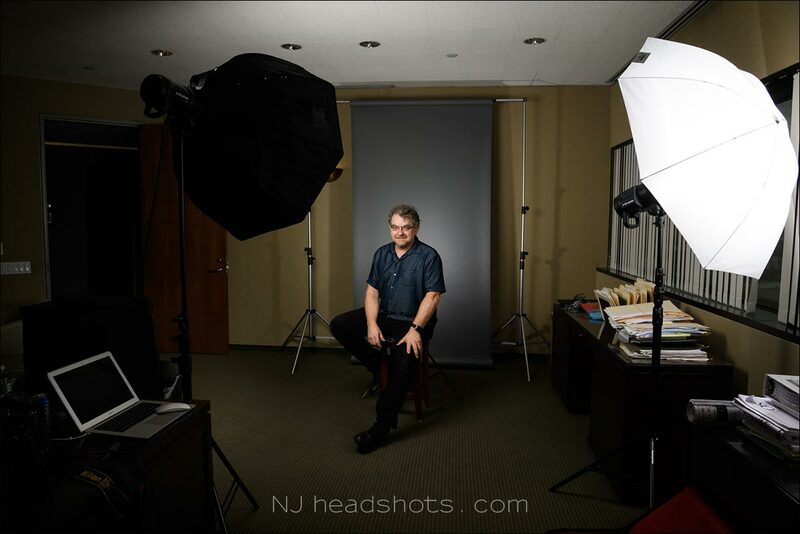 Often enough, there is the requirement to reverse-engineer existing headshots on a company’s website. We need to match the photos we take at this particular photo session, with existing photographs taken elsewhere by a different photographer with an unknown setup. That’s always a fun challenge, and I am quite confident we can match any particular look to give you a consistent look and branding. In the next few examples you can see some of the variety in shooting and lighting setups that I have used in the past. Any of the gear shown here will fit into two roller bags so that everything is quickly brought onto your premises, and can be quickly set up, and just as quickly be broken down and packed away. This was a fairly simple setup in a hotel lobby area. 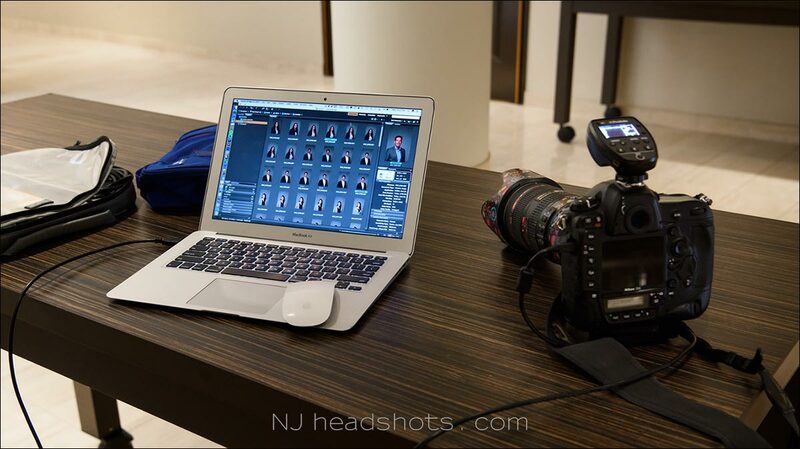 We had to shoot 15 headshots during the hour-long lunch break of a business meeting at an airport hotel. A quick setup; a few test shots; and we were up and running, and completed the shoot before lunch break was over – including image selection. With this, the photo session wasn’t an interruption to the event. 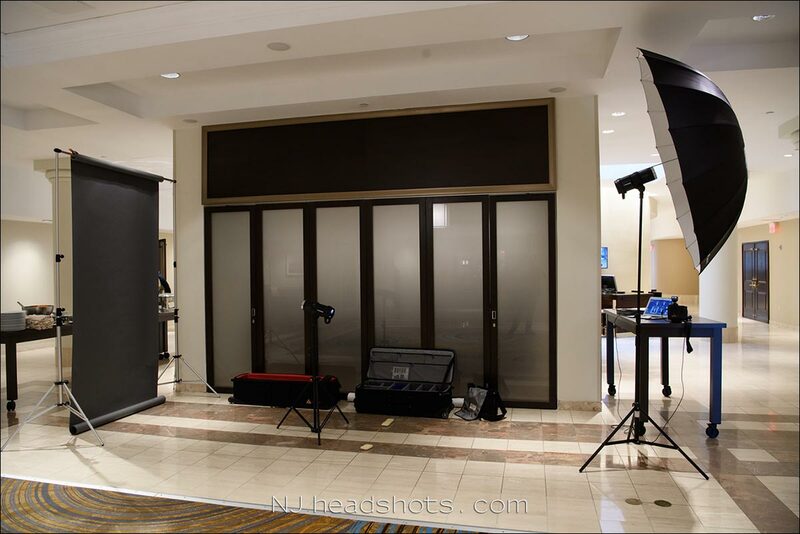 One of the setups where I had to reverse-engineer an existing look to the company’s headshots. This setup was in the middle of their office space, and people took turns for their photos, and did the image selection on the computer right there. With about 5 minutes per person, it was barely a ripple to their work day. This one was a bit of a challenge. We had only an hour to photograph various groups of people during a large convention at the hotel. So we set up five similar shooting stations, and allocated 5 minutes per group. Very quick and efficient, keeping everything rolling with no interruption to the convention’s program outside of the allocated hour. Again a setup within an office to photograph a number of employees in sequence. A more elaborate setup with four lights, matching the requirements of the company.